2015 Kia Sedona Pros and Cons: Why (Not) This Car? But anyone who admires a machine that has been thoroughly designed for a particular purpose will find much to like in a minivan. No other vehicle type can transport five-plus people and their stuff nearly as well. And no other vehicle type can be packed with as many features. So I'm happy to see that Kia, despite a subpar initial attempt, has not only not abandoned the minivan, but with the redesigned 2015 Sedona has made a serious attempt to revitalize the class. At first glance the styling and feature list impress. But how does this third iteration fare in a thorough comparison against the segment leaders, the Honda Odyssey and Toyota Sienna? Also the most stylish minivan on the inside. Again nothing crazy--except maybe the huge console. Why the 2015 Kia Sedona? For at least its first decade in the United States, Kia relied on aggressive pricing to sell its cars. As we'll see, the new Sedona is a far more competitive vehicle than those early Kias. But price remains a very good reason to buy one. Compare base minivans, and you'll find that the Kia Sedona, with a starting price of $26,795, undercuts the Honda Odyssey and the Toyota Sienna by about $3,000 and about $2,700, respectively. Want heated leather seats, three power doors, and a rearview camera? A Sedona EX with Premium Package, with a list price of $34,745, undercuts the Odyssey EX-L by $1,860 and the Sienna XLE by $1,240. Much smaller differences, plus the competing vans also have a few hundred dollars in additional features. Or maybe you want everything? Here the story gets more complicated vis-a-vis the Honda. A Sedona SX Limited with Technology Package and entertainment system, list price $44,290, undercuts the Odyssey Touring Elite by a mere $1,140. But the Kia includes $3,800 in additional content that you simply cannot get on the Honda (more on this soon). Adjust for this content, and the total difference ballooons to nearly $5,000. A Toyota Sienna Limited Premium with Advanced Technology Package includes about as much content as an all-boxes-checked Sedona, but lists for $3,745 more. In recent years Kias have competed nearly as much with additional features as they have with lower prices, and the new Sedona turns this strategy up to eleven. The tested van included, among other things, 19-inch chrome-finished alloy wheels, auto-dimming HID headlights, a heated steering wheel, heated-and-cooled front seats, second-row seats with lounge-style legrests, soft "nappa" leather upholstery, power sunroofs over both the first and second rows, an Infiniti surround sound audio system, an around-view camera system, adaptive cruise control, forward collision warning, lane departure warning, and blind spot warning. Most of these features are not even available on the Odyssey. Most, but not all, are offered on the Toyota Sienna, which offers a few features you can't get on the Kia, most notably all-wheel-drive and a power-stowing third-row seat (though not both in the same van). Both the Honda and Toyota offer entertainment systems with a ceiling-mounted double-wide screen that can function like two separate displays. The Kia's entertainment system includes only a single conventional display that flips up from the center console. I nearly forgot the Honda's major unique feature: a built-in vacuum. In one unplanned test I found it only somewhat effective, so this feature should have little impact on purchasing decisions. Then there are the features all three minvans offer, but other vehicle types do not. Only the largest SUVs have a third-row seat any adult would want to spend much time in. Those in these minivans are roomier and more comfortable than you'll find in any crossover. In all but the lowest trim levels the second and third rows have sunshades on the wide windows, a feature normally restricted to luxury cars. Plus it's much easier to get into the rear seats of a minivan thanks to sliding doors (no dinging your neighbor in a crowded parking lot) with large openings and, on all but the lowest trim levels, remote power operation. The new Sedona expands this advantage with second-row seats that compact tightly against the front seats to open up an especially large walk through--unless you get the SX Limited with its lounge-style captains chairs, which have their own advantages. So this is what Lincoln was trying to achieve with the MKT. Smaller rear window key to sporty look. The top-of-the-line Sedona SX Limited includes these lounge-style second-row seats. The third-generation Sedona does minivan things well. But so do the Honda Odyssey and Toyota Sienna, so doing minivan things well isn't a reason to buy a Sedona instead of one of the others. What the Sedona has that the others do not is a strikingly attractive yet thoroughly tasteful interior. Unlike in competitors, you'll find no odd or poorly integrated styling elements. Plus the materials are better than you'll find elsewhere, with more soft-touch surfaces and few bits that look or feel cheap. The Honda Odyssey's interior looks and feels especially plasticky. In the EX, SX, and SX Limited (tested) the leather seat trim (soft nappa hides in the last) is two-toned with contrasting piping and stitching. You can opt for gray and charcoal on the EX and SX. But the camel and charcoal (as in the tested van) feels much warmer. On the SX Limited, a gray and burgundy interior is also available. The cloth interior in the L and LX is largely a single tone, but in the LX one of these tones is again the warm camel. In contrast to all of these, Kia (under the design direction of ex-Audi star Peter Schreyer) has given the new Sedona minivan a healthy dose of thoroughly tasteful styling. The front end appears bold without looking like it's trying to be something it's not (e.g. an SUV). The fenders have a subtly sporty flare to them. The rearmost side windows are a bit less tall than the others to further accentuate the flared rear fenders. All without substantially compromising functionality. Has a box ever been better-looking? Like the Honda Odyssey, the Kia Sedona has earned top scores in all of the IIHS's crash tests, including the challenging small overlap test (failed by the Chrysler and Nissan minivans). To help the driver avoid minor and major scrapes, the Sedona is available with a full array of warning systems and an around-view camera system. Why Not the 2015 Kia Sedona? There aren't any strong reasons not to buy the Sedona. Yet when a friend recently bought a minivan his wife wouldn't even look at the Kia. Why not? Because it's a Kia. Some bases for this prejudice remain. Past Sedonas haven't been nearly as reliable as a Sienna or an Odyssey. Plus many Kia dealers have been with the company since its less illustrious days. Their showrooms can be small and shabby (though some newer ones are anything but), and they developed a culture that focused on buyers most other auto makers would not loan money to. I recently stopped into a Kia dealer to research how the seats operate in a lower level Sedona--and was kicked out. I'd folded and unfolded the seats a couple of times, and was in the driver seat when the sales manager informed me: "We're going to be showing this van soon, and can't have you slamming stuff around in here. So I'm going to have to ask you to leave." I've been visiting car dealers to gather information for my reviews for over 15 years. The great majority have been very helpful. This is the first time I've been bounced from one. Maybe the manager didn't have faith that the seat mechanisms could withstand a couple of folding and unfolding cycles? Whatever the manager's motivation--I still can't believe it happened--that dealer isn't doing much to improve Kia's image. Noise levels might be a little lower than in the Odyssey, but are significantly higher than in the Sienna. Especially on the highway some people might wish for a quieter vehicle. Even at lower speeds the tires thump thump thump across even small bumps. Buttons too hard to single out at a glance. Like the Odyssey, the Sedona has a jigglier ride than the Toyota Sienna. Then again, I tested the SX Limited, which wears Continental CrossContact LX Sport tires size 235/55HR19. Other Sedonas wear tires with more sidewall, and consequently might ride a little more smoothly. Even the SX Limited's ride is smooth compared to that of most crossovers. Most Kia Sedonas earn EPA ratings of 18 mpg city, 24 mpg highway. This is just a bit worse than the Sienna's 18/25, but well below the Odyssey's 19/28, at least on the highway. But the SX Limited, with more heft and different tires, rates only 17/22, the lowest of any current minivan. In my real-world sub-freezing driving the trip computer reported averages between 16 and 21 in the suburbs (depending on the number of stops, amount of traffic, whether the engine was already warmed up, etc.) and about 25 on the highway. The Sienna managed about the same--but with all-wheel-drive. A front-wheel-drive Toyota should do a little better. In somewhat warmer weather, the Odyssey managed as high as 25 on my standard home-to-school run. The Kia Sedona fails to match the fuel economy of the Odyssey and Sienna despite having a smaller engine, a 3.3-liter V6 vs. the others' 3.5s. Then again, this smaller engine is more powerful, 276 horsepower vs. the Honda's 248 and the Toyota's 266. Kia wrings more power out of a smaller engine partly through direct injection. Also, the 3.3 peaks a little higher than the others, with maximum torque at a fairly lofty (especially for a minivan engine) 5,000 rpm. It has plenty of oomph for most driving even at modest engine speeds, but really comes alive (making sweet sounds in the process) over 4,000 rpm--where minivan drivers aren't likely to venture. Acceleration is similar in the other two minivans. You can get more power in some crossovers, but I'm not sure when it would ever be used in this sort of vehicle. As in most other current Kia's, the Sedona's steering effort can be adjusted. In "comfort" it's at least as light as the overly assisted (for me) wheels in the Odyssey and Sienna. In "normal" mode the Kia's steering weights up more as the wheel is turned, which I prefer. If memory serves, though, the steering in the Chrysler minivans is at least equally firm and weights up more naturally. The Sedona handles curves with good control, a moderate amount of lean, and a little more dry-road grip than the others. It's a little more fun to drive than the Odyssey or the Sienna, this being quite relative. I enjoyed driving a Dodge Grand Caravan more than any of these, but that experience was a few years ago, and I wonder if my impression would be the same today. In light snow, on the other hand, the Sedona's Continental CrossContact LX Sport tires did not grip as well as the others. And only the Sienna offers all-wheel drive as an option. All three minivans have comfortable front seats. But the Kia's driver seat is the best in the bunch thanks to a 4-way (instead of 2-way) lumbar adjustment (sadly absent from the passenger seat) and larger, better contoured side bolsters. Long drive? No problem. I also like the driving position in the Kia, with an instrument panel nearly as low as the Honda's for an open view forward. Visibility is also good to the sides and rear. Still, the top trim level's around-view camera system was a welcome feature in parking lots, as it makes parking this large vehicle fun rather than a bit of a challenge. On the other hand, the Kia's front row doesn't feel as roomy due to a very tall, non-removable center console that extends all the way to the instrument panel. This console lends the Sedona a sportier character, and has a large storage compartment inside, but some people would prefer more room to stretch out. You can even remove the Honda's more compact console entirely if you want to open up a pathway to the rear. The Honda also has a lower step-in height, which is a major consideration for some people. The controls could use a re-think in all three minivans. In both the Sedona and the Sienna, those along the right side of the center stack are too far away. The Sedona further suffers from having overly small buttons laid out in long rows, where they cannot be distinguished at a glance. The latest Sienna controls include larger buttons in smaller groups. The Honda's controls have somewhat different issues. As in the Sedona, the buttons are too small and could be better laid out. Unlike in the Sedona, read-outs are split between two displays, one of them a touchscreen, the other knob-operated. This confuses most people. A tough choice must be made for the Sedona's second-row seat. Most Sedonas have a pair of buckets that collapse tightly against the front seat to make it easy to access the third row or to maximum cargo volume. (These seats cannot be removed.) In the SX, these seats can be heated, a feature you won't find in other minivans. In the SX Limited, these seats are replaced by lounge-style seats with legrests, but without heaters. In their normal position, the seats cannot go back far enough for their legrests to be used by people much over five feet in height. But they have an additional adjustment that permits them to be moved inward (eliminating the walkway between them). Do this, and they can go back another eleven inches. This eliminates third-row legroom entirely, but even tall adults can now use the legrests. Extend the legrest, recline the seat back, and you'll be hard-pressed to find a more comfortable way to travel (until someone offers such seats with heat and ventilation). The front-wheel-drive Sienna is offered with similar seats, but they lack the lateral adjustment, and might not be able to travel back as far. On the other hand, the Sienna's seats are simpler to operate. Reach for one of the four levers on the side of the Sedona's fancy seats and you'll often grab the wrong one. Not available in any Sedona: a three-person second-row. If you need space for eight people, you'll be choosing between the Odyssey and Sienna. The Sedona has about as much room in the second and third row as the Sienna, but a few inches less total legroom than the Odyssey. Properly adjust the second row, and there's enough room in each row for a pair of a adults. This said, the view forward from the back rows is more open in the Honda and Toyota thanks to more of a stadium layout and smaller headrests. The third row allegedly can fit three people in any of these vans, but this would be a tight fit. Leg support is better than in the third row of any crossover. With the dual sunroofs, though, adults near or over six feet in height could come into contact with the headliner. If this is a concern, get one without the sunroofs. Very few crossovers have enough space behind the third row for a family's luggage. None approach the Sedona is this area. But the Odyssey and Sienna have a deep rear cargo well much like the Sedona's, but with a few more inches between the tailgate and third-row seatback (roughly 20 vs. 23 inches). The width of the Sedona's cargo area also isn't quite as wide as the others (roughly 50 vs. 52 inches). These differences come through in the cargo volume stats. Behind the third row the Sedona can hold 34 cubic feet, the Odyssey 38, and the Sienna 39. Stowing the third row to yield a flat floor expands cargo volume to 78 cubic feet in the Sedona, 93 in the Odyssey, and 87 in the Sienna. Granted, this stat is a little tricky, as it's not clear how the second-row seats were positioned when measuring it. Those in the tested van had nearly 20 inches of travel--a huge amount. The length of the cargo floor behind them can vary from 43.5 to 63 inches. Need more than 63 inches of floor? Then you need a Sedona other than the SX Limited. In the others, innovative second-row seats collapse tightly against the front seats. Unfortunately, I was unable to measure the length of the floor behind them before getting expelled from the Kia dealership (see the brand reputation section). In the Odyssey, the second row seatbacks fold to yield a flattish surface well above the cargo floor. Or, unlike in the Sedona, you can remove the seats from the van. (Kia is likely correct in asserting that hardly anyone goes through the trouble to do this.) In the Sienna, the second-row seats can be collapsed (in a different, less compact fashion than the Sedona's) or removed. Bearing these differences in mind, maximum cargo volumes are 142 cubic feet in the Sedona, 148.5 in the Odyssey, and 150 in the Sienna. If these figures assume a collapsed seat in the Sedona but removed seats in the other two, the Kia stacks up well. But the 6.5 cubic foot difference seems too small given that the collapsed seats still take up about a foot of length and that the Kia cannot hold as much behind the second row. These minutiae notwithstanding, the Sedona can probably carry all that you'll need it to. It might not be able to hold quite as much as the others, but it can still hold far more than any crossover. The largest of these, the GMC Acadia, can only fit 24 cubic feet behind its third row and 116 cubic feet with both rows folded. The format of these reviews, since it always includes "why nots," can make it hard to tell when I really like a car. 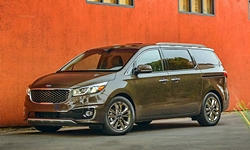 Well, I really like the new Kia Sedona. It combines the unbeatable functionality of a minivan with more style, more luxury, and more features than you'll find in any other minivan. Add in better steering than the Honda and Toyota, and the Sedona is also a little more enjoyable to drive. Looking at the other side of the ledger, none of the negatives is likely to be a deal killer. You can get a little more space for luggage in either of the others, and some more space for people as well in the Honda. You can get all-wheel-drive and a quieter, smoother ride in the Toyota. Perhaps of more concern: the new Sedona's reliability is unknown. Or maybe none of these is a big deal to you, but you just cannot see yourself owning a Kia. Well, unless the dealer throws you off the lot, that's just silly. Kia has come a long way over the past decade, and there's no sign that their progress is about to end. Similarly, more people need to discard their prejudice against minivans. If you need a way to transport a bunch of kids and their stuff, nothing else comes close. This is as far out of the way as the Sedona SX Limited's lounge-style seats can get. Kia and Honda each provided an insured vehicle, for five days and a week, respectively, with a tank of fuel. 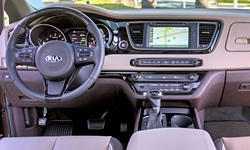 2015 Kia Sedona pros and cons, according to Michael Karesh: the best reasons for buying (or not buying) the 2015 Kia Sedona. Join TrueDelta to post your own impressions. Seems that the rear/side visibility would be limited without the optional "around view system." With those small side windows, i'm not sure if a 3rd row passenger could even see outside. The rearmost side windows aren't significantly different in size from the Toyota Sienna's. Realize that the Sienna "hides" the tracks for the sliding doors at the base of those windows, so they're reduced in size much the same way. I didn't notice any visibility issues. Both my wife and younger daughter (neither of whom generally cares much about the looks of cars) have commented recently about Kia's cars being exceptionally good-looking. Signed - an Audi (2011 S4) AND Kia (2012 Soul) owner. Good point on the new Q7. The Sedona--a minivan--is far more attractive. You're certainly welcome, Tom. Thank you for posting such an informative comment.